Presenting project recommendations to city staff and councillors isn’t a requirement of most university courses. But Wilfrid Laurier University course Social Innovation in the City (SE330) isn’t like other courses. 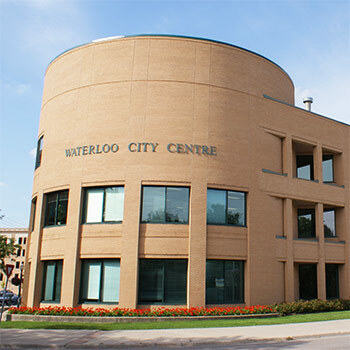 The course, at the core of the CityStudio initiative at Laurier’s Waterloo campus, allows students to work with city staff on municipal projects while earning academic credit. Throughout the course, students learn theoretical frameworks and innovative techniques being used to address social and community challenges around the world. CityStudio Waterloo is part of C3 Innovation Labs (C3IL), which offers experiential learning opportunities to students across the “three Cs”: campus, city and community. At the end of term, students present their solutions to the identified local challenges to city staff and councillors. The most promising ideas may be pursued through student summer internships or other opportunities. CityStudio courses are also offered at Laurier’s Brantford campus. John Abraham, assistant professor and CityStudio Waterloo faculty liaison, says Social Innovation in the City is a course that offers students an opportunity to contribute innovative and impactful solutions to the city they live in. Students in the winter 2018 offering of SE330 worked on three projects related to the city’s strategic plan: enhancing transparency and citizen engagement in participatory budgeting; designing parkette spaces in the Northdale neighbourhood; and developing a community engagement strategy for the Albert McCormick Community Centre. Third-year student Perri Termine was part of the student team that collaborated on the Albert McCormick project. The community centre on Parkside Drive is well known for its twin ice pads and branch location of the Waterloo Public Library. The centre also offers a variety of community programs led by city staff. But despite its services, amenities and location in a diverse neighbourhood, local uptake in the centre’s community programming is low. Throughout the term, Termine and teammates gathered research through on-site observations, interviews with city and community stakeholders, and case study analysis. After reviewing their findings, Termine’s team identified priority areas for change, and proposed short-term strategies to transform the centre’s physical space into a place where community thrives. Recommendations include enhanced exterior lighting, defined pathways and unobstructed sightlines of the building to create a more inviting façade. Within the centre’s interior, Termine’s team suggested defined social areas with comfortable seating, and the inclusion of community art to promote creativity. “The SE330 course experience reinforced the prioritization of empathy in problem-solving and innovation, and the responsibility we have for the people we are working with,” says Termine, who is pursuing Laurier’s Social Entrepreneurship Option. The three project teams presented their research findings and short-term recommendations at Waterloo City Hall on March 23. Witzel also says he is excited by the students’ final reports and looks forward to implementing the appropriate student recommendations. That kind of professional feedback is validating for Termine. “From my experience in SE330, students feel their ideas are valued by city staff. By trusting and empowering students, the CityStudio partners contribute to a deeper campus-city-community relationship in Waterloo Region,” says Termine.